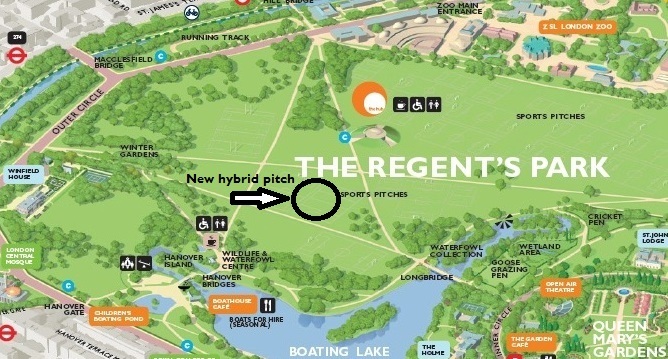 The Royal Parks has received £396,000 from Sport England for a pilot scheme to install cutting edge technology under one of its existing football pitches in The Regent’s Park to transform it into a grass hybrid playing area. It will be the first time a pitch of this type has been installed in outdoor public sports facilities in the UK. The pilot project will see innovative hybrid matting buried under the natural turf, allowing grass to grow through while helping to maintain the condition of the pitch throughout the year. The current sports pitches are designed for 12 hours play a week, and at times during the winter are closed due to wet weather. The new hybrid pitch can take a lot more play and wear before it becomes too worn. This will allow thousands more people to enjoy sports in the park throughout the year, with particular focus on 11 to 14 year olds as the new hybrid area will also provide two new nine-a-side pitches, which are ideal for that age group. “We are delighted that Sport England has supported our application to trial one hybrid pitch. This is a great opportunity to further invest in our facilities and encourage thousands more people to take up sports. We have done a lot over recent years to increase participation by offering a much broader range of sports in the parks, but more people means more wear and tear which is why we are trialling this new system. “As we are working in natural, historic parkland we will be undertaking this project as a trial. The trial will examine how well the new surface works, how it looks, and what maintenance is needed to achieve higher usage without damaging the new surface. "In keeping with our aim of increasing physical activity, Sport England is pleased to support the trial of this innovative hybrid pitch by The Royal Parks charity. As the new pitch has a longer lasting and more resilient playing surface it can be used intensively for longer periods. So with less downtime due to wear and tear, greater numbers of people will be able to access a quality playing surface for longer and benefit from physical activity." Work on the new pitch has already started with the first players expected to use it from the beginning of October. During the trial, the performance of the pitch will be monitored by Royal Parks’ wildlife and horticulture experts.